With its very subtle flavours, this dish is a proper healthy family meal. A part of the ancient Syrian cuisine, I was taught this at a very young age by my mothers closest friend. My aunt by choice rather than blood, the most wonderful cook and human being, with the magic to create the most beautiful dining table laden with a delicious array of dishes. With her beloved Syria clearly under destruction she is heart broken. Many of us are at similar cross roads, having been displaced or immigrated, even if it was out of choice. With these thoughts in mind, I have decided and wish to now embark on my next cookbook journey which is all about "Food Across Borders " and how Parsi Food has survived. In that very same context I am offering this recipe as a "candle of peace and hope". Remembering my aunts homeland lovingly with the best and universal language of caring, harmony and warmth; food. Knowing in my heart that this form of continuity honours Syria's rich culture, history and heritage over the centuries. A simple dish of meats, eggplants, tomatoes and rice. Boil together in a large stock pot until tender; the meat, onion, cloves, pepper corns, cinnamon, cardamoms and salt in the 8 cups of water. Top up with water as needed allowing for about 6 cups of stock to be left over when done. Strain the stock through a sieve and keep aside. Roast on a cookie sheet, till golden brown; the aubergines, brushed with olive oil. Sprinkle over with salt after it is done. In a skillet heat the oil and fry the 2 onions until caramelised to a golden brown. Remove and keep aside. In the same skillet fry the hand cut chopped meat until nicely browned. Sprinkle it with salt and the garam masala; continue to cook it for a minute or two. Remove from the flame and keep aside. In a large lightly greased pot arrange the two sliced tomatoes on the bottom. 3 cups of washed basmati rice. Pour 5 cups of the meat stock over ensuring the rice is completely covered. Bring it all to a rapid boil and allow it to cook until you see the top of the rice cooking. Now add the last cup of stock mixed in well with the tomato paste and lemon juice. Finally add the rest of the roasted eggplant/ aubergine slices. Cover the pan tightly and steam for a good 25 minutes until the rice is cooked through. Allow it to rest for another 10 minutes and overturn it on to a platter. Add your favourite cinnamon, cardamom, nutmeg or other mild crushed whole spices if you wish instead of the garam masala. You may need a 3rd extra eggplant/aubergine to get the number of slices needed. The roasted aubergine gives the dish creaminess. Save the pine nuts for sprinkling at the very end if you do not like them ''cooked''. 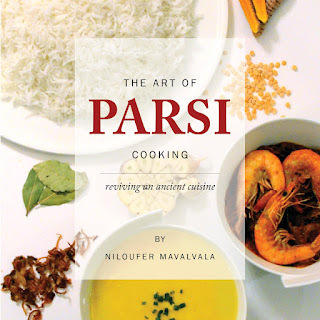 For my Parsi Food recipes and its history and origins read The Art of Parsi Cooking; reviving an ancient cuisine.